Lucy M. Browning1 , Shiun Dong Hsieh2 and Margaret Ashwell1. Nutrition Research Reviews (2010), 23, 247–269. doi:10.1017/S0954422410000144. 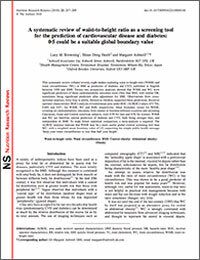 A systematic review of waist-to-height ratio as a screening tool for the prediction of cardiovascular disease and diabetes: 0·5 could be a suitable global boundary value. ¿Te interesa recibir más información sobre Cambridge Weight Plan?